How do I contact New Horizon? How is New Horizon organized? We have a pretty standard voluntary organisation structure of chair, secretary and treasurer. These are elected at an AGM each year. We plan on holding a committee meeting once a month to plan and coordinate activities. Each Wednesday we hold a drop-in clinic on the Direct Provision site. This deals with health, education, housing and family support issues. Volunteers tend to create their own roles taking into account their previous skills and experiences. These may not correspond too well with the official structure but do definitely work. What is New Horizon’s Mission Statement? What does New Horizon do? 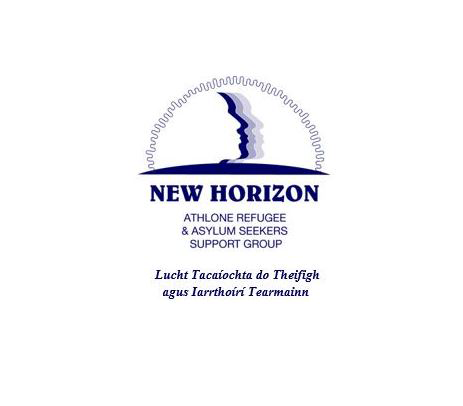 We are a front line refugee support group mainly working on the Lissywollen Direct Provision site in Athlone. Our focus is on providing information and help to the 300 (on average) residents living there. New Horizon does not have any full time staff which is the major cost for many organisations. Our working budget is approximately €5000.00 pr year. It is funded by small scale grants from Westmeath Community Development Ltd. Individual projects are funded from various sources such as the Health Service Executive (HSE) and St. Stephen’s Green Trust. Will New Horizon be registered as a charity soon? Yes, this part of our plans for 2018. On what grounds can people get asylum? Where does the funding to run the site come from? The site is funded from the Department of Justice budget. This is ultimately funded by general taxation. The Reception and Integration Agency (RIA) runs direct provision sites around the country. In turn, RIA has management and security contracts with a number of companies. Will the 2015 International Protection Act speed up decisions? Hopefully it will but that is yet to be seen. The 2015 International Protection Act came into effect in January 2017. The previous legislation, the 1996 Refugee act, specified that separate decision and appeal process were to be followed for a decision on refugee status and subsidiary protection. This led to severe backlogs in processing. The 2015 International Protection Act sets up a single process for both refugee status and subsidiary protection. Additional backlogs were created by moving from the 1996 to the 2015 process. How do people end up in Athlone? Everyone in the DP site in Athlone is what is described as a ‘Convention’ refugee. People who have arrived in Ireland under a United Nations resettlement program are known as ‘Programme’ refugees. Convention refugees are people who have made their own way to Ireland and have applied for recognition of refugee status when they arrive. Various official and unofficial routes and methods are used to travel to Ireland. These change continually, depending on weather conditions and enforcement levels at crossings. On arrival people are normally housed for a few weeks in Baleskin, near Dublin airport. They are then dispersed to various direct provision centres around the country. What skills does a volunteer need? Volunteer can usually design their own job, depending on their interests, skills and experiences. Technical skills, while useful, are not that terribly important. It’s very important to bring a caring and respectful approach to this work. Residents have frequently come from a very traumatized background in their home country and while travelling. Patience and persistence are a must. Counselling skills are very valuable. You may be exposed to some very difficult stories. Be careful of your own mental health. Ask other volunteers for help when you need it. What Languages do people speak? The working language on site is English. Most people will have a basic understanding of spoken English but their abilities to read and write English are likely to be limited. Other languages include French, Arabic, Urdu, Farsi and Russian. The languages spoken tend to change as the population of the site changes. Young people on site tend to speak up to four languages fluently. Be careful about using ‘unofficial’ interpreters for anything that could be confidential. How do we deal with cultural differences? We get things wrong all the time! But if you deal patiently and respectfully with people they will forgive you almost anything. If you are male, don’t offer to shake hands with a Muslim woman. Remember to include male family members in discussions. Be aware of the language, gender and religious composition of any groups you work with. Are Refugee interested in meeting local people? Some people are very open to meeting people outside the site and taking part in social and educational activities. Others, mainly because of language and cultural constraints, are very fearful of the world outside the gates. These people are generally in most need of support. You can offer but don’t be disappointed if your first offer is refused. Be persistent.